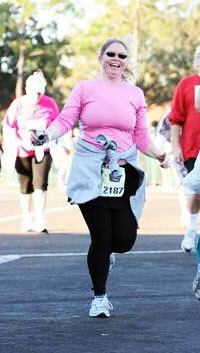 Tracey's Story about how she started running. It is funny how over the years your life can change so much. Growing up I was the smoker, drinker, burnout, party girl, who never worked-out at all. Working-out was not even in my vocabulary; it was all about going out and parting. Don't get me wrong here, I had fun and although things have change drastically in my life I would not trade those years for anything. But today all I think about is exercise; I want to work out all the time. I think the big change came when I got my divorce. I was so unhappy back then I guess you can say I hit bottom. My salvation was the gym. I joined a bodybuilding gym by my dad's (I moved back home after the divorce) and started going at 4:30am Mon-Fri. I was overweight and had no clue what I was doing, but I was going to get in shape. The only people at the gym at that time were people who were serious about working out, I mean if you get up at 4:30 to workout you are going to get in a good workout or you mite as well have slept in. I don't know what they all thought of the short fat girl who obviously had no clue what she was doing, but after a couple of months we would all talk. They all started to train me, show me what they did and how to do things the right way. I guess they realized I was not going away so they should try and help before I broke everything in the gym. Well I got into shape and lost all the weight. For the first time in my life I felt great. Things had changed and my life was going in the right direction. This is where my love with working out started, and when my life changed. I ended up quitting smoking because I was pissed that I worked out so much and still was out of breath climbing 3 stupid flights of stairs, so the smoking had to go. This all just became a part of my life. I got into running after I had my baby. I was talking smack with some people from work about running a 5k and then realized that I better start training if I didn't want to look stupid. I ran most of that race with my sister, my now husband and pushing my daughter in her stroller. This is where my Love of running started, and it has only grown since. Read more about Tracey's Story and what is going on with her now at her blog MidWest Running Mom.